Plickers is an assessment tool used with the iOS or Andriod app on an iPad or smartphone. Each student is given a card with a unique visual code. The code has 4 sides, each lettered A, B, C, and D. The student holds the card so that the letter they choose to answer the question with is at the top of their card. The teacher uses the iOS or Android app to slowly scan the room. The app recognizes the cards, records who the teacher assigned them to, and captures the answer that the student chose. The app will only record each student’s answer once, so there is no worry of a second scan skewing data. 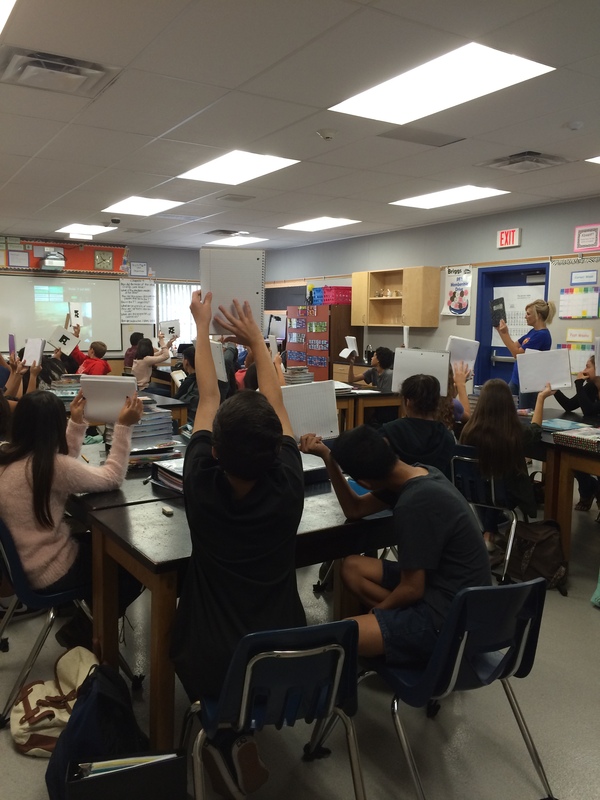 One way Mrs. Jamie Consiglio-Lahti, 8th grade science teacher from Chino, California, uses Plickers is to have her students answer the “Problem of the Day” which supports them in reviewing questions for the Science CST that takes place in the spring. Plickers creates a graph of the overall class score as well as individual responses. Checking for understanding is instant. Rita Pierson’s message is as profound as it is important. She reminds us to keep our eye on the true spirit of why we became educators in the first place. I love how she points out that kids don’t learn from people they don’t like. I can’t agree with Ms. Pierson enough on this point. Children “feel” their teacher and have a keen sense of awareness of their teacher’s like for them. As a teacher I loved being in the classroom with my students. I made sure they knew it was “our second home”. I occasionally shared information about myself and always verbalized to them that I cared about them and their progress. Our classroom environment was relaxed yet rigorous. Students worked hard to complete group assignments and felt safe coming to me with their questions. You know the cliché, “No question is a stupid question”. As cliché as it was, it was true. I got to know my students by having them write in a daily journal, and I would respond to all of them weekly. On any given school year I felt like I had 38 mini families. Today, as a school administrator, my role with students is differently defined. On any given day I do my best to make verbal contact with as many students as I can. My hope is that educators make connections with their students and families, and never forget that students are the best part of our job. -Embrace their individuality. -Be the CEO of your classroom. -Create a community within the classroom. -Classroom teachers-Learn all students’ names within 48 hours. -Examine and improve nonverbal communication. -Treat all students with dignity and respect at all times. -Let them get to know a part of you. Technology is no substitute for an inspiring teacher. However, on-line materials are available 24 hours a day as compared to approximately five hours a day of classroom instruction . Information technology allows learning anywhere, anytime. A few resources used in various school districts are Safari Montage , World Book or teacher selected materials. When virtual manipulatives are used in a traditional classroom setting it goes far beyond chalk and talk. The teacher can conduct onscreen investigations and demonstrate concepts far more easily than with just words and arm-waving. When students have access to the same tools over the web, their understanding of concepts will be reinforced by reviewing on line materials until information is understood. Teachers are able to select and post specific videos, organizers, and instructions to a shared folder or even a classroom web page. With the use of technology students may be given projects that require them to learn (pull) necessary material themselves. Students will build their ability to retrieve information they need without being in the physical presence of a teacher. This project-based learning or pull approach makes learning more interesting for students. This may also be viewed as differentiating instruction. In the more traditional days of education, students could write in a notebook and what they wrote was seen only by the teacher. With modern technology students can create a PowerPoint or Prezi presentation, record/edit spoken words, compile digital photography, make a video, run a class newspaper, operate a web based school radio or TV station, compose digital music on a synthesizer, make a website, or create a blog. Really, the possibilities are endless. That is exciting! A vital skill in being successful with Common Core State Standards (CCSS) is being able to collaborate with peers. The digital world supports collaboration projects with those who may not be physically close. This can best be done using computer tools such as the Google Hangouts or Microsoft office 365. Rather than laboring alone on homework or classwork, students may work in small groups wherever they happen to be. We will soon see that The CLOUD will be a student’s best friend. It seems so simple. There are variables such as cost, infrastructure, and teacher training which will be determining factors of success in the transition of utilizing technologies in the classroom. Theses variables need to be given careful attention as the face of education shifts to CCSS instruction. Shifting from a paper-based world to a primarily digital world in which all students and teachers have access to a personal computing device and the internet at any time is defined as Digital Conversion. This change in schools would support today’s technological demands of 21st century learning. It would affect instruction, pedagogy, professional development, student and teacher motivation, the relationship between teacher and student, and the way information is learned. In August of this year May Valley Elementary School in the Floyd County School District celebrated the launch of its new launch Digital Conversion Program in which Dell Latitude Education Series laptop computers were given to all 5th and 9th grade students, teachers and staff members. Next year more computers will be rolled out to students as the school continues it shift towards Digital Conversion. Prior to students receiving a laptop, parents signed waivers to ensure their children would properly care for the device, and students took an oath and pledging to be “good digital citizens”. With the progression of time it is of great hope to see students accessing an equitable, effective digital learning environment within their school day in order to foster skills needed to be globally competitive adults. What knowledge is absolutely essential for every learner? This is a fair question to ask any educator for the answer defines the function and purpose of our craft. First and foremost, it is imperative for educators to create an educational environment where every student can succeed in accessing their curriculum and feel safe while learning. With the recent statewide adoption of Common Core State Standards (CCSS) students are expected to think critically, collaborate with one another, tap into their creativity, and utilize effective communication in preparation of college and career readiness. Prior to CCSS students were taught in a teacher centered classroom environment. Being able to come up with the correct answer on an exam was measured as proficient. Now students are expected to explain their thinking through performance task, and having more than one plausible answer is necessary. Since the expected outcomes are so different from what has been asked of teachers and students in the past, delivering instruction will require a complete shift in teaching practice. In these changing times, one essential and common approach for educators is to step forward, unafraid, into CCSS, and find as many resources as possible to learn what they will need to know and do. Education is no longer defined in terms of what a teacher will teach but rather in terms of what a student will be able to demonstrate. This shift will change the way in which curriculum is defined and technology is used in the classroom. We will look at embedding technology into teaching strategies for student success as it will guide our youth towards college and career readiness.